Most Common Questions | Getting Legal Help to Settle Debts | The Consumer Law Group, P.C. Below are some initial questions many clients have when they first contact The Consumer Law Group, P.C.. The questions below can address many initial concerns you may have. If you don't find the answers here, you may contact us for answers to more complex questions or questions specific to your case. Should I consider using a debt settlement company to get out of credit card debt? The answer to this question in one word is NO. No matter how desperate you are to get out of credit card debt, a for-profit debt settlement company is NOT the answer. If you contract with one of these companies, you will most likely end up in worse financial shape than you are now. Pay an up-front fee of 10-20 percent of your total debt. Pay additional account maintenance fees of up to several hundred dollars per month. Deposit money every month into an escrow account held by the debt settlement company. Stop making payments to the credit card companies—in other words, default on the debt. Commit to a 36-month minimum contract. You may wonder why anyone would agree to these terms, but these companies are very good at hiding the fees and bottom-line cost of the plan, so many people have no idea what they’re getting themselves into. And some of these offers are complete scams; they have no intention of negotiating on your behalf. They are simply taking your money. Who Should You Turn to for Help? As soon as you run into trouble with your credit cards, you should stop using the cards and contact the credit card company directly to try to arrange a payment plan. They are not likely to be overly generous, but you may be able to come to a workable agreement. Avoiding the problem or turning to a third party will just make things worse. If you are looking for someone to advocate on your behalf, the attorneys at The Consumer Law Group, P.C. may be able to help. As attorneys, we have a fiduciary duty and an ethical obligation to you as our client, not to the credit card company and not to our own bottom line. National debt settlement companies have no such duty and will take full advantage of you. Contact us today for a review of your situation to see if we can help. How do creditors get paid with this program? We will help you set up a special debt settlement account in your name. You will make payments into this account. As soon as there is enough funds, we will use that to negotiate a payment plan with your creditors. Do I really need a debt settlement attorney? Debtors who retain a debt settlement attorney are usually able to get lower balances to pay off and in a shorter amount of time. Also, attorneys know state and federal consumer legislation and will protect your consumer rights. The process can be complicated, and an experienced attorney can help settle your debts faster and with less hassle. 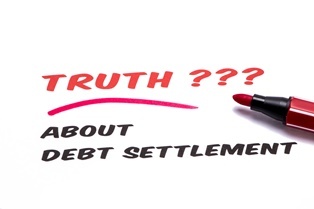 What types of debts can be settled with debt settlement? Debt settlement applies to unsecured loans. These loans are credit card bills, both current and past, medical bills, repossesions and personal loans. Secured debts, which are student loans, car loans and mortgages cannot be settled with debt settlement. How long does debt settlement take? The debt settlement process time frame varies depending on your circumstances. It depends on the amount of your debt and how much you can pay per month. Negotiations can take several months, and it typically takes from 12 months to 36 months to pay off your reduced debt. Once again, the time frame can be longer or shorter depending on your situation.